One of my favorite things about going to conferences is all of the exciting ideas you come away with. At MozCon 2013, which just ended yesterday, the focus was on creating quality content strategies. You can spend a few hours perusing the site, reading some product descriptions and blog posts, and form an opinion based on what stood out to you. But a loosely structured audit won’t give you the whole picture. To really understand the quality of the entire site, you need to assess each page* on the site with standard metrics, so that they can be combined to describe the site as a whole. *Each page is obviously ideal, but if you’re working with a massive site or simply don’t have the time to do a full audit, use analytics to get a sampling of popular, average, and low traffic pages. Also, you only need to look at the last year to half a year of blog posts. Use the page type column to categorize your pages. You can be as broad as separating “home,” “navigation,” “product pages,” and “blog posts;” or as specific as breaking out the types of products or blog posts. The decision should be based on how carefully you want to assess sections of your site. If you want to use this data to filter your blog post themes or product categories, be sure to separate those out. Ex. REI has an awesome section of their site called learn that just helps visitors with camping/kayaking/rock climbing/general outdoor adventures. Can food processers blend liquids? These are all of the pages that help people buy your product. Most of them are the pages between when a visitor hits “add to cart” and when they confirm their purchase. Those pages don’t need to be optimized for SEO (or even in search engines’ indexes), but CRO changes often make the biggest impact here. Other support for buying, like demos and free guides, are “buy” pages as well. After visitors make their purchase, content that encourages a lifetime relationship falls into the “stay” category. Everything that you offer in a customer portal – order tracking, customer care, member benefits, etc – is a part of the “stay” process. 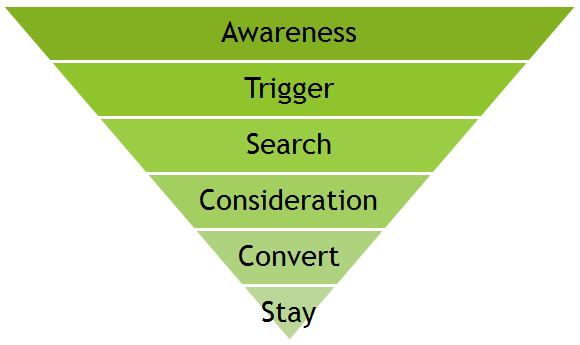 As you go through your list of pages, filter them into one of these six stages. If you use the spreadsheet I provided, you can look at the Results tab and see how many pages you have in each stage. You don’t necessarily want to have one of each. But, use them to ask yourself questions about where you’re spending your time on content. Do you only have a handful of awareness pages and don’t have a strong brand? Do you have a lot of search pages but they’re not delivering much value? You want to get an idea of the traffic a page brings in. But, if you just look at traffic overall, blog posts will look insignificant next to articles that you link to year round, and important seasonal products could look like they get little to no traffic. That said, if you don’t have a seasonal business or don’t have articles versus blog posts, you can use the number of visits you got in the past six months to identify what content is more topical. If you’re an ecommerce site, you might want to put in the profit so that you can compare pages that sold a few expensive items to pages that sold many cheap items fairly. If you work for a B2B site, you can count the number of leads you acquired. If you run an informative site, you can count the number of pages/visit or the average time on site. Even if a page doesn’t directly lead to conversions, it could be bringing value to potential customers and gaining links and shares. Links and shares bring awareness (regardless of the actual page being shared), increase search engine rankings, and indicate respect – and probably staying power – of the person linking or sharing. You can count the number of links or the number of linking domains, but I like Page Authority since it combines the number and Authority of the links, including the internal links you’ve pointed to the page. Gauging quality is tricky by itself, and it’s even harder when you’re asked to put quality into a number. But, without a number and clear reasoning, you’re going to have a difficult time explaining to your boss or client why they generally have “low quality” content. I usually like to rank quality on a scale of 1 - 5 because it's simple but gives you the flexibility beyond "awful," "medium," and "exceptional." Is the text easy to read? Does it have short, clear sentences? Is content broken into sections and easy to skim paragraphs? Does the content feel like it was written for humans or computers? Is there redundant keyword stuffing? Awkward placement of phrases for keyword stuffing? What’s your gut feeling: is it the right tone for the audience? Does the page explain who the company is? Does the page explain what the company does or sells? If someone entered the site from a navigation page, would s/he understand where s/he was? Include a short description of this selection at the top of the page, as well as branding. Is the text focusing on telling the visitor to buy rather than explaining why the visitor should buy? Why would someone want to read this? What would they gain from reading this? Is that relevant to the company? How often does the company post? How regularly do they post? Can visitors figure out when they can come back to read new posts? Look at the comments – do people seem engaged? Is it filled with comment spam? Is the company responding to comments? Just to be careful, note if the page has duplicate content or doesn’t have enough content. To check if a page has duplicate content, pick a sentence and search for it in Google with quotation marks surrounding it. Google will return a list of pages with that exact sentence. If multiple pages have the same sentence, check a couple more sentences, though: one paragraph at the beginning or in the sidebar won’t make a page duplicate content. Pages should usually have the brand name and a bit of explanatory text above the fold. If the top of the page is filled with many images, it may appear to be more ads than content to Google and be penalized by Panda. If the design is clearly ad-free but has under 150 words, it will be difficult for search engines to understand the content on the page. The great thing about doing detailed work like this is, you’ll cover the audit from multiple angles. By going through each page individually, you’ll identify all content that could eventually cause a penalty and needs to be removed (or flag content that could eventually be a problem). By looking at the traffic, links, and quality, you’ll be able to compare all of the pages on the site to find the most outstanding pages, which could very well spark an idea for your content strategy. And, by putting all of those metrics together, you can look at the site as a whole and identify which type of content you’re lacking, and where your content strategy should fill holes. For those of you who have done content audits in the past: is this how you do content audits? What would you add? Comment below!